. Your cart will total 134 points that will be converted into a voucher of $134 towards your next purchase! Must be logged in to collect points. The Isotherm Cruise 130 Drink is a special version of the Cruise 130 providing the customer with an extra space for drinks instead of the traditional freezer compartment. 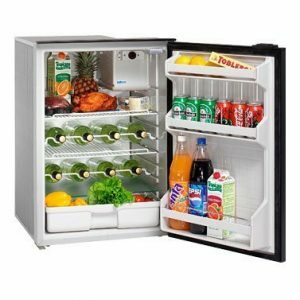 It is equipped with interior light and a fan for cool air distribution inside the fridge. Wine bottle racks are available as option. 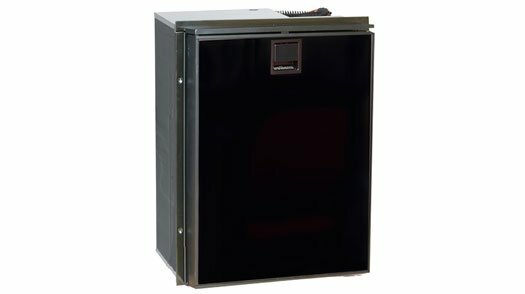 The Isotherm Cruise 130 Drink is a large 4.6 cubic foot under counter fridge with innovative cooling evaporator protected by an aluminum shield with built-in air circulation fan that pulls cold air across the evaporator and circulates the air in a convection to keep temperatures the same on top and bottom shelves. A condesation tray positioned under the evaporator captures condensate and channels it out the back, into an evaporation tray. This keep the Cruise 130 Drink free of frost issues. The CR130 has more storage capacity than other fridges with similar dimensions in this class of refrigerator. With three molded shelves on the door, cradles and adjustable holders, the CR130 provides ample storage to keep bottles and jars upright and secure. Vegetable bin and hatches in the three adjustable internal shelves allow the storage of tall bottles internally. The Isotherm Cruise 130 Drink refrigerator pairs perfectly with the Isotherm Cruise 90 Freezer to make the ideal side by side, under the counter refrigerator and freezer combination. The Cruise 130 Classic comes equipped with a proud-mount, 3-side black flange.